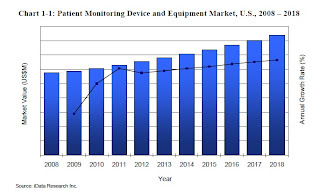 The increasing popularity of wireless equipment to monitor patients' vital signs is expected to drive much of the growth in the expanding sector of medical monitoring, according to recent research. Monitoring in general has become more common throughout emergency departments and the regular wards of hospitals, where, until recently, most patients' vital signs were not monitored continuously, according to a recent study published by iData Research. In 2011, more than half of all hospitalized patients were monitored. In addition to the recent growth in monitoring within hospitals, the practice has also increased in other settings, such as home health care. The use of monitors is expected to continue expanding in all health care settings and segments. With the increased use of monitors, the use of wireless monitors has grown sharply, as such technology offers many medical benefits. One of the most often cited benefits is allowing patients recovering from surgery to stand, walk and move around, which has been shown to shorten the recovery period. By 2018, the number of wireless monitoring devices in use will have more than doubled compared to the number of such devices in use in 2008. With many wireless monitoring devices on the market, one of the main factors influencing a hospital's choice of equipment is whether the monitor uses regular Wi-Fi or is run on WMTF, the dedicated medical bandwidth. When choosing which to use, hospitals and other institutions usually weigh the convenience of Wi-Fi, which already exists in many settings, with the security of WMTF. In addition to the growth in the use of wireless devices, the telehealth market is also growing rapidly, meaning more patients are being monitored remotely, from their homes or other places. The aging U.S. population is the main reason for such growth, as more patients manage chronic diseases from home. 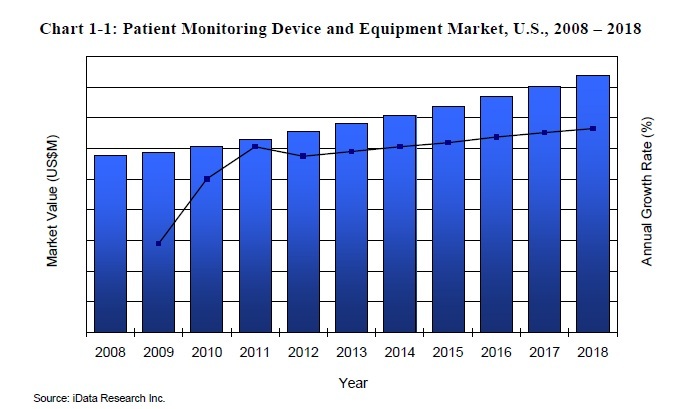 Telemonitoring grew 16% in 2011, with most of those participating patients having cardiac implantable electronic devices. According to iData Research's report, monitoring continued to grow across many medical fields, including those methods used to track patients with epilepsy, heart problems, and traumatic brain injury. The use of fetal monitoring for pregnant women had actually declined in the last few years, but is back on a projected path of steady growth, according to the research. Fetal and neonatal monitoring had declined due to the economic recession, but is growing again as expectant mothers are becoming more aware of its benefits, and as new technology has recently allowed for less invasive monitoring methods.